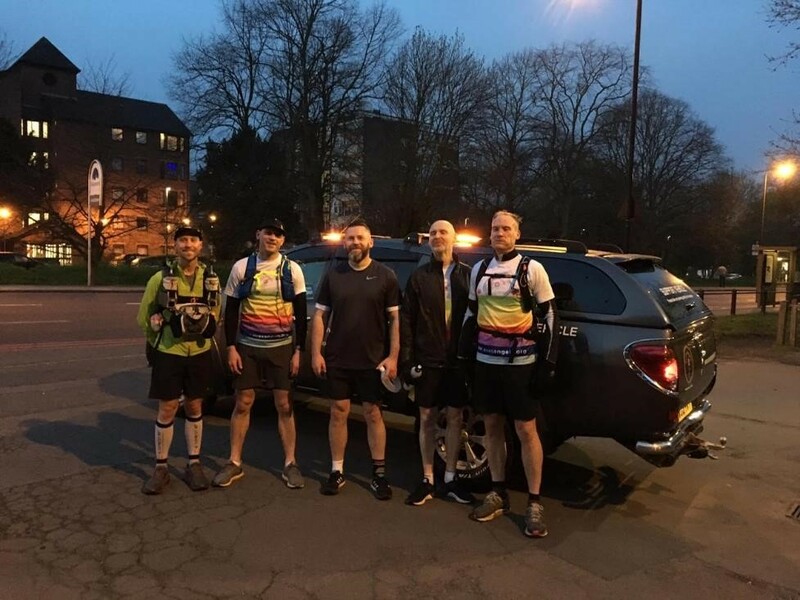 Like ancient warriors before a battle, James Maybourn, James Cullen, Lee Giles, and Dean Giles met at the battlefield the night before the bloodshed. The air was cold, the wind still. It was strangely quiet for a Friday night in London. I felt excited and nervous in equal measure. Six months of training had got me to this point, despite some setbacks with illness, I was injury free and healthy. 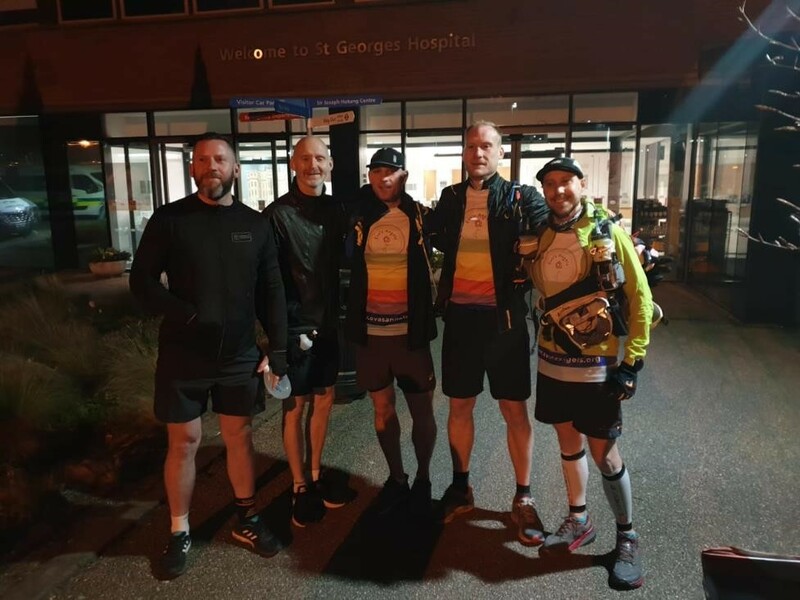 For three of us, it was our first battle of this kind, a run from St. George’s hospital in Tooting to Herne Bay in Kent. About sixty-five miles. We stayed at a hotel on the hospital grounds and set our alarms for 4:30. Very unlike an ancient warrior before a battle, I dressed into my rainbow styled t-shirt and filled my bags with jelly babies for the journey. It was the day before the two-year anniversary of losing my daughter, and this challenge was undertaken in her name. Eva’s Angels was started in Eva’s memory. We lost her to Diffuse Intrinsic Pontine Glioma (DIPG) more recently classified as Diffuse Midline Glioma (DMG). It’s a savage type of brain tumour that has a 0% survival rate. Around thirty children in the UK are diagnosed every year. That’s a classroom full of infant children who are lost to us, just in the UK. Every single year. DIPG affects the part of the brain that regulates movement, breathing, swallowing etc. As the tumour grows, these kids lose the ability to walk, and eventually to swallow. They are physically disabled, but completely cognitively aware. It’s a slow and cruel death for innocent children. 1. To relieve the needs of families who have a child who is terminally ill with cancer, or are a bereaved family who have recently (in the last three years) lost their child to cancer by, in particular but not exclusively by the provision of short breaks and holidays. 2. To relieve sickness and promote and protect good health by raising awareness of and providing funding for research into the treatment of Diffuse Intrinsic Pontine Glioma (DIPG) and other terminal childhood brain tumours. Nerves were high when we set off. 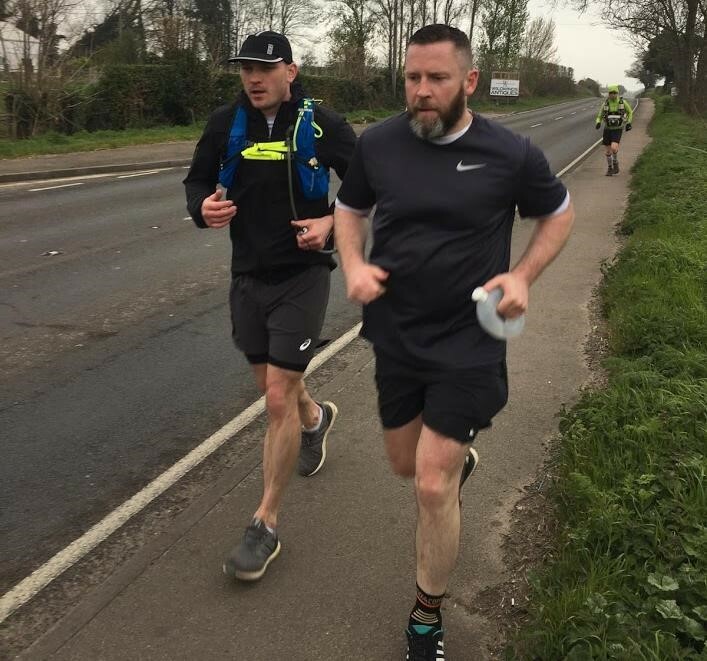 I was embarking on an unknown challenge, as the furthest distance I had run before was twenty-six miles, we were now attempting two and a half marathons in a single day! 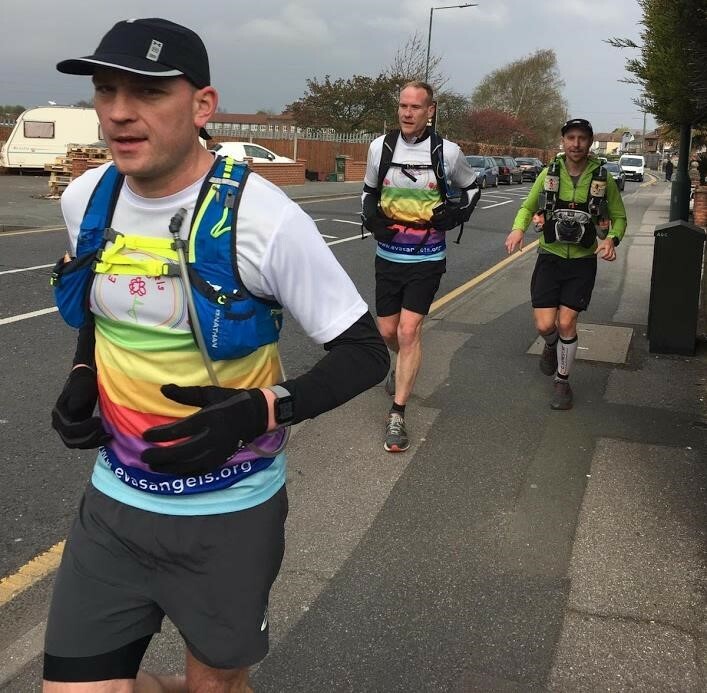 James has experience at these ultra-marathon distances and set us a schedule to stop every three to four miles to re-fuel, and work on a run/walk strategy from start to finish. It’s amazing how many calories you burn in an event like this. Each stop was a beacon of light where I would stuff myself with sweets, nuts, oats, and re-fill with water. John and Matt were there the whole way to carry our gear and provide help if needed with an Eva’s Angels sign written truck. I learned a few things about running, and about myself over the proceeding hours. Running long distances is part preparation, part psychological, and part raw determination. The months of training in preparation can make your day easy or hard. I honestly don’t think I could ever have been fully prepared for this. The first fifteen miles were great. The pace was slow, we were filling up with fuel along the way and spirits were high. 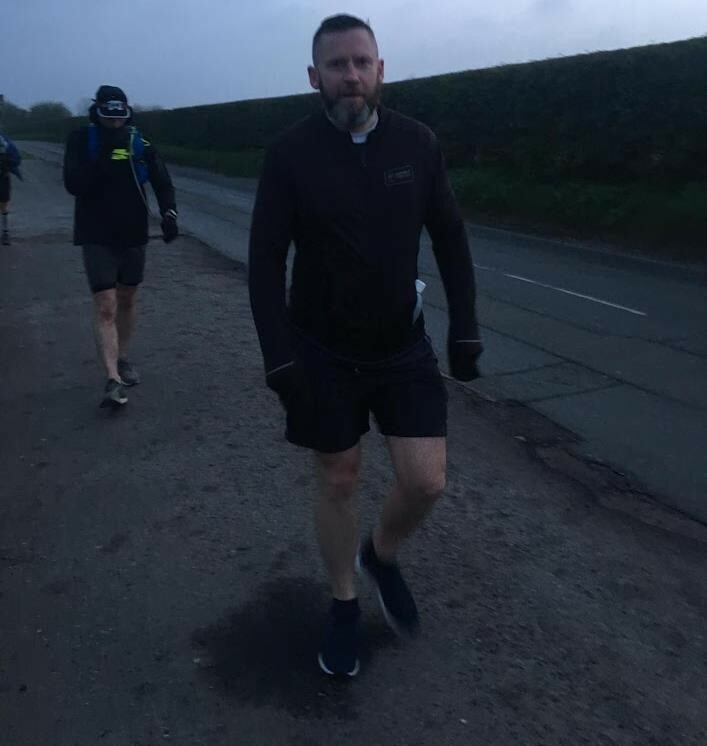 Even at mile twenty-seven, the furthest I had ever run at that point, I felt strong and willing. James set us up on an eight-minute run / two-minute walk pattern, and we were eating up the miles. There was a point, soon after the thirty miles mark, I started to feel the pain. A simple mistake, my socks were slightly too tight which aggravated my foot. Soon, it was beginning to throb and was painful to bend. Around the forty miles mark, I hit what can only be described as “the wall”. I wanted to stop. My foot was in agony with every step, and I started to feel feverish, like I was having waking fever dreams. It was weird. Knowing at this point that I still had roughly a marathon to run was troubling. Lee was still running strong. This was despite the fact he thought he wouldn’t make more than half the distance due to a hip injury. Jim was charging along, strong as an Ox the whole way. James was there making sure we were keeping to the schedule and offering words of support when needed. I knew I couldn’t stop, no matter how much I wanted to, it was too early. I had to dig deep and find a way to get through the final miles. At this point we were running along the undulating A2. Harsh concrete paths with busses and cars speeding past us just inches away. I’m sure Eva was with me at this point. My body was finished, my mind was starting to abandon me, and there was only the road ahead, one foot in front of the other. Repeat. Forty miles painfully turned into fifty miles, and that wall I hit was now falling on top of me. The only way I could deal with the situation was to close in on myself, not speak to anyone and focus every ounce of energy into forward motion. Faversham Highstreet was the point I had to stop running. My foot was so bad that I simply couldn’t bend it enough to run. We stomped on, at a fast walking pace. Mile after mile after mile. We walked down towards Seasalter, John’s support van behind us on the dark country road. Head torches on, we continued into the night as the temperature sharply dropped. It was in Whitstable that I couldn’t take another step. My body had simply stopped working. I collapsed into the support truck and immediately fell asleep. 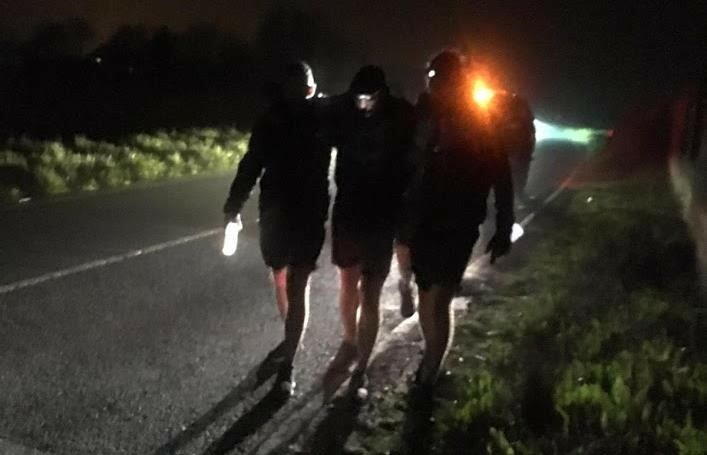 I regained consciousness, and despite my team mates being in severe pain, they carried me out of the truck and helped me stagger the final distance to the finish line. At the finish point, we were greeted by friends and family to a truly emotional finale. I have never been so happy to the welcome sign to my home town! We did this for you Eva. We did this for all the other families out there that are suffering through childhood cancer. We hope that we can make a difference, even a small difference, in the lives of these families. I want to send out a massive thank you to everyone who supported us along the way. So grateful for the friendly faces who clapped us along. 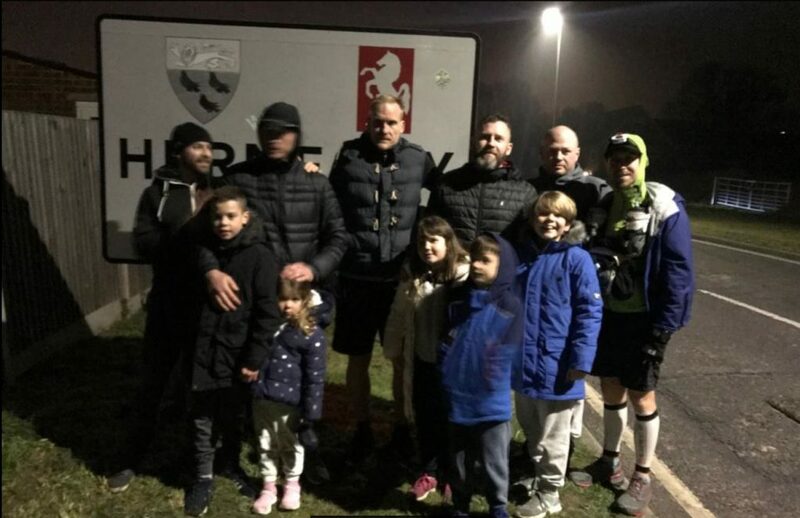 Thank you to everyone for sponsoring us. Eva’s Angels would not be able to continue without our sponsors, and we love you for that! !